Apart from the new version of OS X Yosemite, Apple has recently released a new iOS 8 beta to developers. Just like the previous beta, this one contains a bunch of noticeable improvements and tweaks that allowed to make Apple’s mobile operating system more stable and efficient. iOS 8 beta 3 has a build number 12A4318c. As to the improvements, they include new options for iCloud Drive, several enhancements for Settings app and the ability to enable or disable QuickType. The guys from the Cupertino have also tweaked the interface of the Weather app and added new wallpapers. Apple is expected to launch iOS 8 in September, alongside 4.7-inch and 5.5-inch iPhone 6 release. The new version of the operating system for iPhones and iPads will reportedly be compatible with the iWatch and feature a health-monitoring app Health. 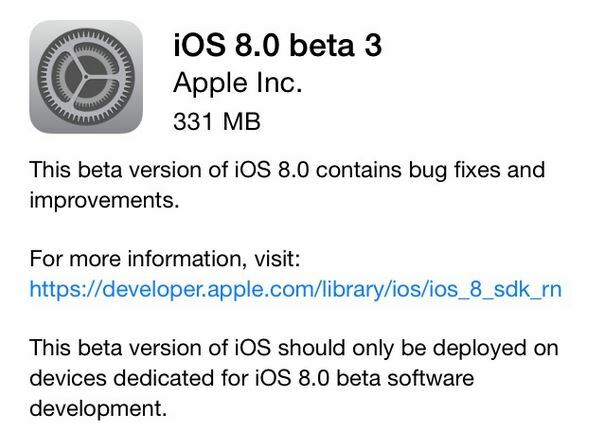 Those who have a developer account can download iOS 8 beta 3 from Apple’s developer portal or via Software Update. The system is quite unstable now, so you’d better think twice before installing it on your device.